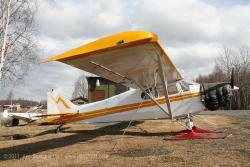 Piper PA-14 Family Cruiser pictures and information. Few airframe parts, lots for engines, accessories, wheels, brakes, etc. The PA-14 fuselage is 4" wider than the PA-12. 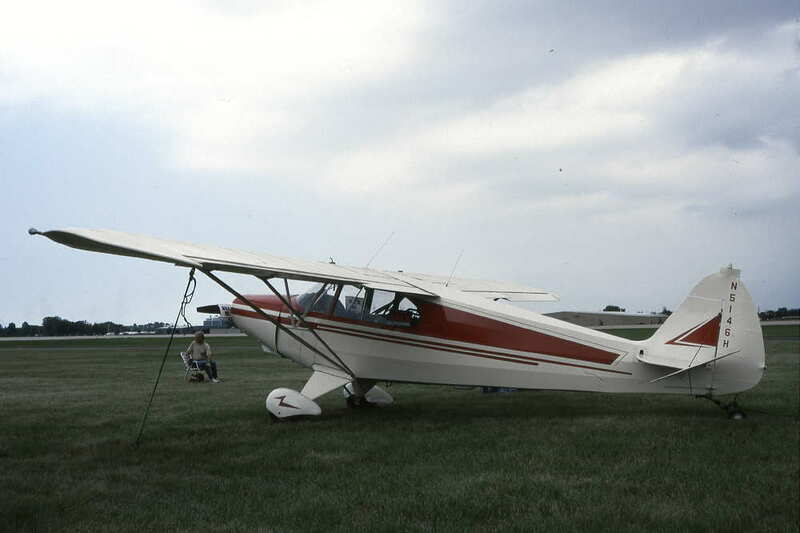 It is a (cozy) four-place aircraft; has the same gross weight as the PA-12, and was built with the same O-235 engine. It did however, come from the factory with flaps. 237 PA-14's were built in 1948-49; 126 are still on the U.S. Register, and an astounding 81 of those (64%) are in Alaska! There are nearly 20 in Canada. 1948 PA-14's start with SN 14-1, and 1949's at 14-490. Piper PA-14 Family Cruiser N4201H waiting for spring, on the edge of PALH Lake Hood, Anchorage, AK 4-08. The wings and vertical tail look stock, but it has a retro cowling and an O-320 engine. Here's a list of the mods it has, from an ad I saw on 2-22-11 (Scroll down). It's probably fairly typical of many PA-12 and PA-14's. Piper PA-14 Family Cruiser N4215H with O-320, retro cowling, seaplane door, PA-18 landing gear and elevators, and big wheels, at Z41 Lake Hood Strip, 5-10. I saw it again in 4-11. You can see the two (snug) seats in the front. It's ready for action! Piper PA-14 Family Cruiser N4217H, with a big Lycoming but the original cowling; PA-18 landing gear; and seaplane door, at Z41 7-04. There's a quiet richness about this airplane. Piper PA-14 Family Cruiser N1423P, ex N4220H, at PAHO Homer, AK, 4-08. A fresh rebuild and I believe, before it was flown. It has an O-320; stock cowling; greenhouse; PA-18 landing gear and elevators; split cabin doors left and right; squared off wings with serious tips; and a beautiful panel Ex Canadian CF-RWM. 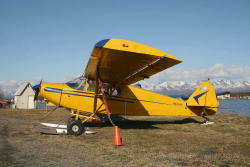 Piper PA-14 Family Cruiser N4236H, O-290, awaiting a new owner and rebuild, at PAHO Homer, AK 4-08. It was pretty pricey, but seeing as how the PA-14 is an Alaskan State treasure, it probably brought it. Piper PA-14 Family Cruiser N4250H sitting tall, with a retro cowl and certainly a big engine; squared wings; PA-18 elevators; at Z41 Lake Hood Strip, Anchorage, AK 5-10. There's something almost "Luscombe" about it. "Sorry" if that's an insult. Piper PA-14 Family Cruiser N4260H with several mods, at Z41 Lake Hood Strip, AK 5-10. Note how the wing tip is warped up. That's a fairly common issue with the wood bows. Piper PA-14 Family Cruiser N4263H with O-360 and retro cowl, on the edge of PALH Lake Hood 5-10. Note the hump in the center, and the slope on sides of the top of the cowl, for better visibility with the tail down. Piper PA-14 Family Cruiser N5112H with an O-320 and PA-18 cowl, on the step in the channel between Lake Hood and Lake Spenard, 5-10. Note the retro rudder and several STOL features. I saw it on the ice in 4-08, on straight skies 4-30-10 and left, and on wheels on 5-8-10. It's a highly modified, all-season beauty. Okay, I can't resist one more shot from 4-11. Piper PA-14 Family Cruiser N5139H on the edge of Lake Hood, PALH, Anchorage, AK, 5-12. Something like this sorta takes your breath away. Piper PA-14 Family Cruiser N5142H, with O-320 and several mods at BGQ Big Lake, AK 5-10. Nice paint lines! Piper PA-14 Family Cruiser N5145H with a J-3 Cub stripe, looking (deceptively?) quite stock except for the wheels, at PABV Birchwood, AK 5-10. I saw it again in 4-11. Piper PA-14 Family Cruiser N5150H at Lake Hood ANC AK 4-08 and 5-10. It's easier to say what IS stock. The rudder! Piper PA-14 Family Cruiser N91449 at AQY Girdwood AK 5-10. It is probably ex N5181H. 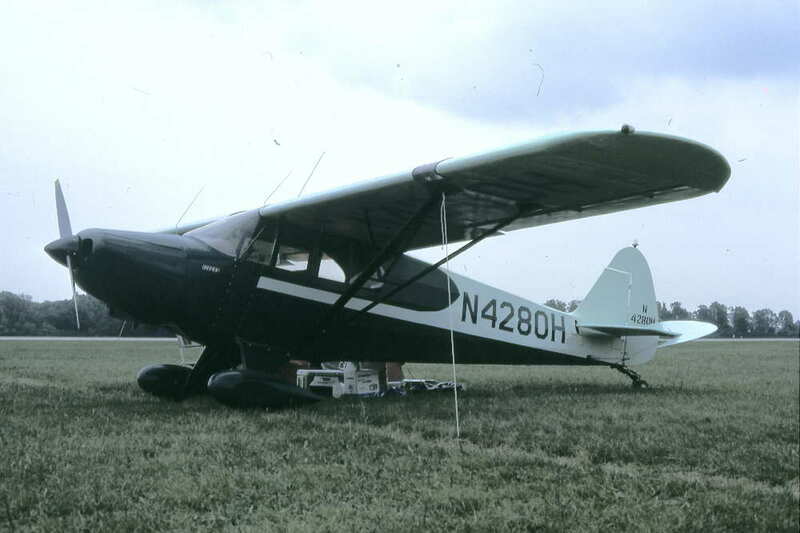 14-506 Piper PA-14 Family Cruiser N5188H, 1949. Seaplane door, skies, VG's, Lycoming O-320 and more, at PAMR Merrill Field, Anchorage, 4-11.